for immediate download on I-tunes. recording for years, mostly at his own expense. It’s starting to pay off. heard in America and far-flung locales like Australia. When asked about his new single, Runnels said, "I guess I would say it came from the Everly Brothers/ Roy Orbison drawer of my song writing toolbox." Riding the ache and hurt of uncertain love, the single melds the emotion to a low-strung baritone guitar. Add the uniqueness of a voice pitched for hurt and sadness, and the song readily grabs attention. Former punk rocker now turned country crooner, Mike Runnels is adding to his album back catalogue with a steady stream of digital singles. The latest is “Tell Debbie." This Texas tunesmith has turned in another tune with all the sound and fervor of original country. With liberal sprinklings of steel and piano, the track is upbeat and pacey, telling of heartache and a longed-for lover’s reconciliation. “I spent my first 18 years in Beaumont, Texas. That gives me the right to play country music, and it’s where I first learned what makes for the best country music.” Mike Runnels bio. All the publicity shots show him as a shy, retiring brooder. The hat dips low, as if to hide the face, while the dark glasses, reminiscent of another Texan, Roy Orbison, conceal the eyes. It’s all mysterious. But then, maybe it’s not. 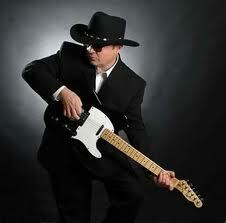 Mike Runnels isn’t trying to win with a Nashville image; rather his calling card is his music. Back onto the shelves with his fifth CD, the one-time punk rocker has delivered, again, with a snappy and customary mix, The Tender Years. Again, he’s written all the songs. Again, he’s kept it simple with basic instrumentation of drums, piano, guitar and steel. And, again, it all works. growing catalogue, not in need of studio magic with countless overdubbing, harmony choirs and production padding; Mike Runnels delivers honest, clean and tamper-free country. It’s not for everyone. But if you like your music with traditional leanings, where the songs stand strong and the intent is to make the mind think and the heart respond, this is for you. The Tender Years, out now on Lucky Penny Records, opens the ten-track set with “Cheatin’ Side Of Town”. Against an edgy twang, Runnels pines while sharing the dark woe of a leavin’ love that’s found willing arms and changed circumstances elsewhere. Runnels, branded as unique by many reviewers and global radio programmers, isn’t afraid to show his battered heart on his cowboy shirt sleeve – real country brings real emotion and mood, a listen to this album shows this Austin local knows how to craft a tune that leaves you changed and charged…and sad. That’s part of the charm here. Runnels juices, pushes and pulls the needed responses. His voice, etched in misery, pain and loss defines what’s great about country music. The voice is a heartache waiting to happen. The lightly tinkered piano on “Last Date”, a stood-up weeper of shattered hopes and lost romance is a tale only the lonely and the jilted will fully understand. But while Runnels stamps his mark on heartbreak, the album comes with tuneful hope. “Now You Know” tells it simply: if you love someone, don’t waste time and opportunity – tell them. Steady streams continue with the melodic and trusting “Just Say So Baby”. An accordion-laced nod to one-sided uncertainty of watching couples has Runnels second-guessing on “I Love You More”. She’s with him but in the words of the song, he loves her more. Again, Runnels shows his lyrical pen comes dipped in the experiences of life. Mike Runnels has been kicking around the country traps of Texas for many years. Too many not to get wider acclaim. With each album, he proves his worth as a writer and singer of common understandings, all fired with a country music passion. Do yourself a favor. Check him out.